Whether you're like movie studios and consider Memorial Day Weekend the start of the season or like scientists and view June 21st as the official launch, there's no denying it now: summer is here. And despite the Back to School sales currently being advertised, it's not going away anytime soon. Summer is traditionally a time when producers of media lighten their output to stores. With the holiday rush several months off, DVD studios rely primarily on films that spent the winter months in theaters. This year's was a particularly light crop and Buena Vista Home Entertainment's offerings are sparse until the end of August. With the warmest weeks of the year bringing vacation and outdoors time to those young and old, common sense seems to dictate not to waste a title's crucial first few weeks of availability on summer, when indoor shopping is more about the air conditioning and the forgotten essentials than it is about impulse buying and movie marathon material. Still, the movie theater is another story entirely and the past five weeks have given Walt Disney Pictures its two biggest hits of the year in Pixar's Cars and Pirates of the Caribbean: Dead Man's Chest, which seem destined to become the nation's two highest-grossing of all summer films. As usual, the output of music branch Walt Disney Records is on the same page as the rest of the Mouse House. One-third of the nine subjects in this roundup come from Cars or Pirates. 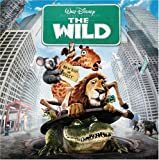 Four others are holdovers from the end of spring: the tween-friendly Disneymania series spins on in two new entries, underperforming CGI flick The Wild gets its obligatory soundtrack, and High School Musical -- the made-for-TV movie-turned-mammoth media sensation -- gets revisited in a two-disc Special Edition soundtrack coinciding with its DVD debut. Rounding out the lot are a soundtrack to the latest Disney movie-turned-Broadway musical (Tarzan) and the lone bone tossed to preschoolers (a soundtrack to Playhouse Disney's "The Doodlebops"). Disney's pop cover project for its expansive musical repertoire is back in Disneymania 4, a release that holds more steadfastly to the pop sound than the previous productions and serves up a mostly less interesting song list from a mostly Disney Channel-bred celebrity roster. The majority of the tracks predictably fall into the "just okay" category -- they're nice to listen to but not so memorable. Of course, there are the real stinkers, inspiring an entirely unintended kind of Disneymania. Chief among them is B5's pathetic attempt at rapping "Who's Afraid of the Big Bad Wolf" (for which a music video is also included on CD-ROM), followed closely by the Cheetah Girls' "If I Never Knew You." The latter has an up-tempo background that makes for a welcome change, but the vocals that straddle it are among the worst that I've ever heard. I imagine an actual cheetah might sound better. Orlando Brown of "That's So Raven" fame is on hand for another round of rap in "Super Cali (BoiOB Version)." I actually must concede that the Julie Andrews remix sounds pretty cool at first and the countless Disney references and Walt praising in Brown's lyrics are kind of nice to hear, but their delivery is too insufferable to save this track. A couple of songs deserve mention of their uniquity. Devo 2.0, an odd group of kids dedicated to emulating the sound of '80s fad band, Devo, deliver a rendition of "Monkey's Uncle" in their signature style. It's neither great nor terrible, but it's interesting for sure. There's also a remix of Christina Aguilera's "Reflection," which was included on the original soundtrack to Mulan, the first Disneymania, and the artist's debut album. Its inclusion on this disc rather than the recently-released DisneyRemixMania is confusing, especially since it's a far better remix than anything that actually made that album's cut, but it adds value here nonetheless. 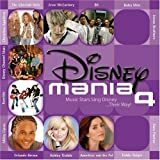 The average and awful aside, there are a few tracks here that really stand out as grade-A efforts, fully representative of what Disneymania is all about. Included in that list are Jesse McCartney's stellar take on "I'll Try" from Return to Never Land, "A Dream Is a Wish Your Heart Makes" by the Disney Channel (Circle of) Stars, and the rockin' "Yo Ho (A Pirate's Life for Me)" by the the Jonas Brothers, a sort of Good Charlotte-for-kids band. Finally, there's Anneliese Van Der Pol taking on Helen Reddy's Oscar-nominated "Candle on the Water" from Pete's Dragon. The drastically different sound takes a little getting used to but turns out to be a real winner. Not only does the "That's So Raven" star have a surprisingly gifted singing voice, but she manages to make the song (one of Disney's finest) her own. It's always nice to see the Disneymania albums go for something a little less mainstream. The first three Disneymanias edge out the newest one on the quality scale, but these four songs plus about seven other decent tracks make it an acceptable enough follow-up, even if the continuing drop in quality in this series is disheartening. 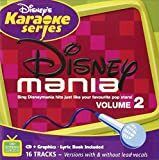 The latest installment in the flourishing Disney's Karaoke Series, Disneymania, Volume 2 should not be confused with the actual Disneymania 2 CD. In fact, the songs included here come mostly from the third Disneymania release. In case you aren't yet sure on just what Disneymania means, it's the name of a popular series (and increasingly, a franchise) of Disney cover songs by pop artists. Each of the eight tracks are presented in instrumental form (plus background vocals) followed by vocal versions beginning with track #9. Don't get too excited, though... they aren't the same artists who appeared on the original Disneymania albums but, rather, replacement singers who sound quite a bit like them. Of course, when used in a compatible karaoke machine and television set, the disc's CD+G technology will display on-screen lyrics and other graphics. For the unequipped, a lyrics booklet is included inside the case. The song selection here is pretty strong and the retail price is low, so those who enjoy karaoke (and this one seems especially prime for the tween market) should find it to their liking. More than any other film in recent memory, The Wild was plagued by negative comparisons to another film. There was good reason for that, because at least on the surface, the similarities are pretty remarkable considering how few movies (and animated ones, at that) make it into 2,500 or more theaters. But, even if Disney's studio line (that The Wild has its origins in the mid-1990s) were to be proven inaccurate, every project deserves to be looked at its own merits, so I won't utter the M-word, nor will I allude to it anymore. The Wild seems to be blazing its own trail at the start of its soundtrack, with a cover of a song most popularly recorded by Iggy Pop. Everlife's "Real Wild Child" is the most marketable track on the album, and as far as teen pop/rock goes, this is surprisingly not at all bad. The two songs which follow - Lifehouse's "Good Enough" and Big Bad Voodoo Daddy's "Big Time Boppin' (Go Man Go)" - don't really do much for me. But, "Really Nice Day", written and performed by Monty Python's Spamalot writers Eric Idle and John Du Prez, has fun incorporating a feel-good mood with an African-esque sound and it seems like an apt choice to be reprised as the finale. The remaining majority of the CD is Alan Silvestri's score, which doesn't sound very derivative of either his past work or other recent entries to the class (family-oriented animation). It is of the variety which twists and turns regularly to fit the emotion of the moment: unbridled whimsy, crawling suspense, imaginative adventure, or peril's-possible solemnity. While pace-changes of such breakneck speed don't often work well for movies, Silvestri's store is fine enough, provided that you take it purely at face value. 1) "Start of Something New"
2) "Get'cha Head in the Game"
3) "What I've Been Looking For"
4) "What I've Been Looking For (Reprise)"
5) "Stick to the Status Quo"
6) "When There Was Me and You"
7) "Bop to the Top"
9) "We're All in This Together"
10) "I Can't Take My Eyes Off of You"
4) "When There Was Me and You"
5) "Bop to the Top"
7) "We're All in This Together"
8) "I Can't Take My Eyes Off of You"
Disney's smash hit TV movie, High School Musical has already birthed one CD soundtrack release (not to mention an entire franchise on the rise) but as with any Disney success, it's been reissued in a timely fashion. In support of the High School Musical DVD release, a 2-Disc Special Edition of the movie's soundtrack made its way to stores in May and this latest edition is the subject of this review. The soundtrack itself, contained on Disc 1, is a fun one. Pop-laden, it surely won't please everyone, but the catchy beats blended with bubble gum pop and Broadway flare provide a platform for more than one style of music that left the limelight some time ago. Ensemble numbers like "Stick to the Status Quo" and two duets, "Start of Something New" and "Breaking Free,"' stand out among the lot and even stranger tunes like "Bop to the Top" are likable. The only true sour spot is the final track on Disc 1, rap group B5's ghastly cover of "Get'cha Head in the Game" (for which a music video is included on the first disc as a CD-ROM bonus). It wasn't in High School Musical itself and the movie was better off for it. It's a shame that it had to be included here but those consumers who actually enjoy it will be glad to see that the Special Edition hasn't given it the axe. The original High School Musical soundtrack featured two karaoke tracks as disc-closing bonuses. The Special Edition pulls those onto the second disc, where they are joined by six new karaoke tracks. These additions and some very snazzy disc art and packaging are the only changes that the Special Edition and its second disc introduce. The karaoke cuts are what you would probably expect: instrumentals and background vocals that are enhanced with CD+G technology so that the use of a compatible karaoke machine and a TV will produce lyrics on screen. Alternatively, the lyrics are printed in the liner notes, along with a double-sided mini-poster (the primary cast/movie logo on one side, Zac Efron and Vanessa Anne Hudgens on the other) and a quickly-expiring code for a free ring tone of "Get'cha Head in the Game." Inexplicably, "Stick to the Status Quo" isn't featured in instrumental form, making it the only major song to not be included. Other than avid fans of karaoke, those who already own the first High School Musical soundtrack have very little reason to upgrade. For newcomers, the packaging and six bonus tracks do add some value, though probably not enough to justify the Special Edition's higher list price. All 19 tracks could have fit on one disc, but reserving the karaoke songs for a separate disc make listening to the soundtrack itself a little less painful...it's just too bad that the B5 cover couldn't have been moved over there with them. The soundtrack to Cars, Pixar's seventh warmly-received blockbuster in as many tries, provides a mix of the familiar and the new. Fulfilling the former are eleven tracks of score composed by Randy Newman, the man behind the music of Pixar's first four films. As seems inevitable for most movie composers, Newman's work here has strong overtones of his earlier Pixar output, especially Toy Story, though its rock flavorings occasionally suggest a "road movie" more than what the first all-CGI flick became and its quieter moments point to a movie far more solemn than Cars is. Without the industry leader's dazzling CGI visuals accompanying it, the score comes up a bit short of the artist's best compositions. Far more surprising is that the remaining nine tracks are lyrical songs, easily surpassing Pixar's previous high and sharply contrasting with the purely instrumental album for The Incredibles, the studio's preceding hit. If Randy's return reintroduces expectations for the studio's music, the vocal lineup shatters them. The nine generally good tunes range from old favorites (Chuck Berry's classic "Route 66" and The Chords' delightfully doo wop "Sh-Boom") to present-day pop icons (Sheryl Crow's energetic opener "Real Gone" and John Mayer's rockin' "Route 66" cover), with two penned and performed by country phenom Brad Paisley offering a shaky change of pace. The disc's highlight is Rascal Flatts' bouncy new recording of Tom Cochrane's early '90s chart-topper "Life is a Highway", which needn't stray from the original to please in big ways. Rounding out the menu are Hank Williams' "My Heart Would Know" (an odd detour from the Newman melodies) and "Our Town", a new tune sung by James Taylor but unmistakably written by the Randster, whose last Pixar outing earned an Oscar. 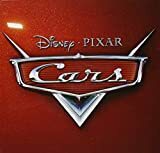 Rarely a studio to miss out on merchandising possibilities, Disney made sure there was room among the onslaught of tie-in merchandise for a second Cars album. 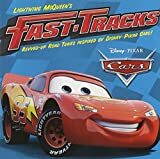 With a cover image of the film's protagonist smiling out at potential customers, Lightning McQueen's Fast-Tracks promises to please, but in fact, it will sorely disappoint someone expecting the official soundtrack. (If nothing else, this group will learn to read before buying.) None of the disc's twelve songs made it into the film, nor would they have any right to. Instead, the "revved-up road tunes", as the subtitle calls them, were "inspired by Disney � Pixar Cars!" But "inspired" isn't a word that comes to mind listening to them. The unifying theme -- automobiles and/or driving on the open road -- is upheld, but that is the only feat readily achieved. The sound -- primarily a mix of blues, rock, and country -- is uneven and usually not too pleasant. At this point, it needs to be said that this companion album seeks to entertain the young, presumably who need music like this to calm them on family road trips. To that end, a few of the tunes (like the environment-friendly "Hot Rod Hybrid") might catch on, and lyrics are provided in the colorful booklet to help. Also mindful of the intended audience, the album features brief transitional dialogue by likable tow truck Mater and the titular hot shot Lightning, who are voiced by Larry the Cable Guy and a passable Owen Wilson replacement. But it just seems like with a bit of effort (or a higher budget), the design in place could have led to a much better companion album. Like one that has more than just one song (the Willie Nelson-scribed "On the Road Again") and no performers that ring a bell. And how is it that there is no room in either soundtrack for Gary Numan's enduring anthem "Cars", which practically begged for inclusion, on name alone? 2) "You'll Be in My Heart"
3) "Who Better Than Me"
5) "I Need to Know"
7) "Sure as Sun Turns to Moon"
8) "Waiting for This Moment"
11) "Like No Man I've Ever Seen"
13) "For the First Time"
15) "Everything That I Am"
Those surprised at Disney's choice to reconfigure Tarzan as its latest Broadway effort most likely are not alone in their confusion. For starters, the film is not a musical in the traditional sense of the word. Sure, there are songs (and good ones at that), but aside from some very brief exceptions, they are sung by Phil Collins, as a sort of all-seeing yet unseen narrator. 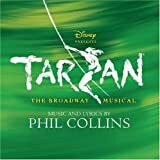 Phil does not appear in the stage production (though the bonus track allows him his own rendition of "Everything That I Am," Tarzan's ballad of self-discovery), but his original songs do. These are accompanied by some new ones, for which Collins is credited with composing both the music and lyrics. Surprisingly, having one creative voice behind all the music doesn't result in uniformity. The new numbers don't quite fit with the sound of the existing tunes, which themselves, while aptly performed by the talented cast, do not seem well-suited for a stage environment. In particular, "Trashin' the Camp" feels much out of place in the middle of a Broadway production. Likewise, Jane's first song ("Waiting for This Moment") is silly to the point of being mildly disturbing, as she lists of an abundance of plant species and calls them her beautiful friends who "want to know me too." Even so, it is hard to judge a production which seems to rely heavily on elaborate sets, costumes, and staging by the soundtrack alone, as listening to selected segments at home can never compare to viewing a performance live. All that said, the disc offers a lot of cheesiness, but then what Broadway hit -- the greatest included -- is ever completely void of cheese? 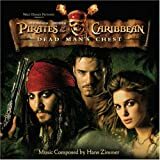 Like the film itself, the soundtrack for Pirates of the Caribbean: Dead Man's Chest is more epic in scope than its predecessor. Just as Klaus Badelt did before him, Hans Zimmer has unsurprisingly managed to capture the world of piracy in a series of instrumentals and in doing so, the essence of the movie as well. The wave-like motion of the rhythm and crescendos perfectly articulate the film's sea setting. Much of the music is dark, brooding, and thunderous, which can wear a little thin after 50 minutes on CD. Fortunately, the film's respites from action provide welcome variation, particularly in "Dinner Is Served" and "Two Hornpipes (Tortuga)," not to mention the oft-recalled Pirates theme. The disc closes with a remix of "He's a Pirate," the closing track on the Curse of the Black Pearl soundtrack. The two versions have very little in common and the remix sounds something like techno in distress. You can bet that if Tortuga had a night club, the Ti�sto Remix of "He's a Pirate" would be their biggest hit, what with the bits of dialogue and sword clashes that are thrown into the mix. Outside of the pirates world, however, this track feels entirely pointless and out of place and is best when ignored. It's worth noting that mega-retailer Best Buy includes two additional remixes as bonus tracks... if they're anything like this one, you're probably safe sticking with the general retail edition. The Black Pearl soundtrack will better please those looking for a few Pirates anthems but Dead Man's Chest is an equally satisfying production. The many filmgoers already won over by the film will find that the Dead Man's Chest soundtrack stays true enough to the original while thankfully treading exciting new ground. 4) "Look In a Book"
5) "I Want to Be Bigger"
6) "Get on the Bus"
10) "Queen for a Day"
11) "Getting Along" 12) "Gibble Gobble"
17) "When the Lights Go Out"
Like the cast of "The Wiggles", another successful musical children's show which airs early mornings on The Disney Channel, the stars of "The Doodlebops" believe in bright colors. But whereas their Australian counterparts draw the line at vibrant turtlenecks, "The Doodlebops" go all the way, with skin and hair that match their loud garments. Perhaps it was that kind of full-body dedication to the craft which led Walt Disney Records to secure the American CD rights to the musical stylings of DeeDee, Rooney, and Moe, the 3-member rock band, while The Wiggles were relegated to tiny Koch Records. 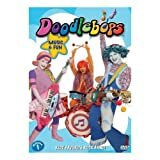 In any event, this 21-track album (the first U.S. audio disc devoted solely to the gang) comes nine months too late for any Internet-savvy, Doodlebop-hungry parent who will have already picked up Universal's Get on the Bus album, released last fall in Canada (the independently-produced series' home). For anyone else who's a fan, Disney's album fills the void nicely and adds two tracks ("Gibble Gobble", "Cauliflower"), while losing none. The songs cross a fair number of styles (some blues, jazz, and a touch of hip-hop shape the all-encompassing pop/rock label) and range from the silly to the transparently educational, but what they all have in common is a pleasantly groovy sound that is sure to encourage singing and dancing along. Roundup posted July 11, 2006. CD reviews written by Aaron, Luke, and Renata.